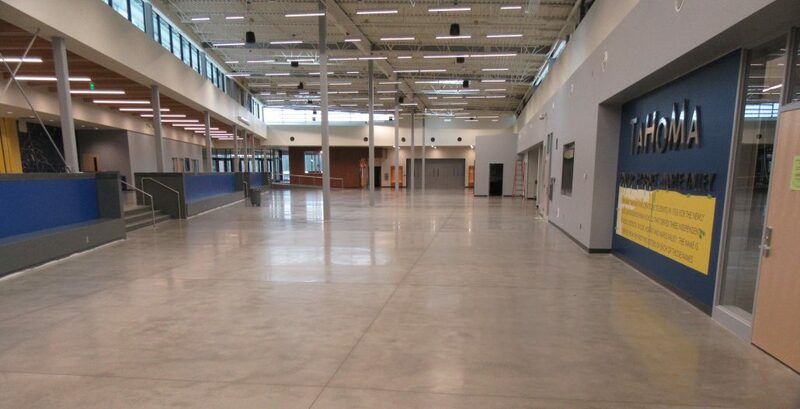 The Concrete Polishing Council defines polished concrete as the result of “changing a concrete floor surface, with or without aggregate exposure, to achieve a specified level of gloss.”1 Concrete polishing is a process where the upper paste portion of the concrete surface is removed. Based on the desired appearance, polishing can expose fine and/or coarse aggregates in the concrete. During the process, a densifying liquid is used to harden the concrete by filling capillaries and pores at the surface. How does Spray-Lock Concrete Protection (SCP) work with concrete that will have a polished finish? SCP Treatments penetrate concrete through the concrete capillary system and react with free alkali to fill the capillaries and connected pore structure. The reaction creates more Calcium Silicate Hydrate (C-S-H) that fills the pores and capillaries with more concrete and densifies the slab. Polishing on SCP-treated concrete may lead to a lighter appearance and may be harder to grind. Typically, the time frame for grinding SCP-treated concrete is comparable to high performance concrete. There have been many SCP-treated slabs that have been ground and polished without the use of an additional densifier with excellent results. However, the contractor can still use a densifier if the project specifications call for one to be used during the polishing process. Using a densifier will not interfere with performance of SCP products. SCP recommends performing a test area for polishing to see the final result prior to polishing an entire floor section. A topical sealer may also be used to help reduce staining of concrete. Allow floors to be polished within 14 days of concrete placement.